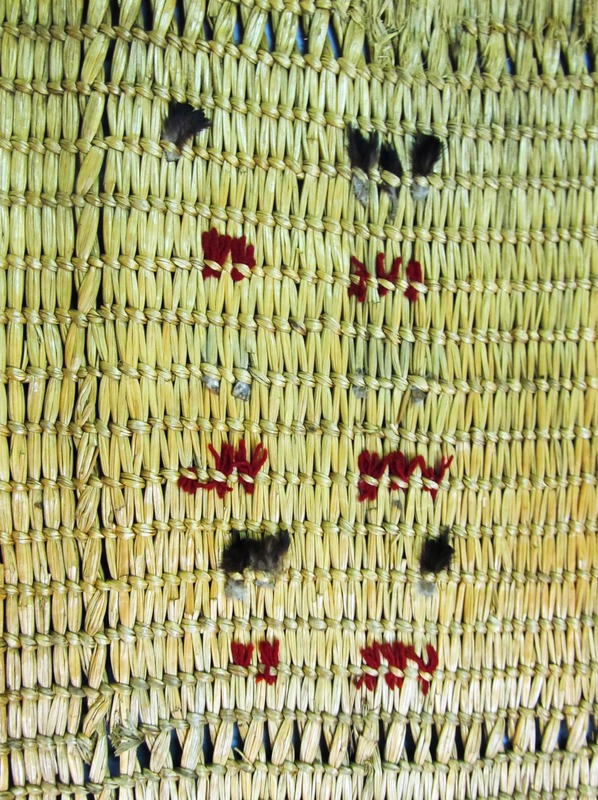 “Sleeping mat woven of grass decorated with feather and red wool.” Large grass mat decorated with small black feathers and red wool. Similar on exhibition at Smithsonian – Sharing Our Heritage – from Fisher collection NMNH E090463 “piirraq” grass mat. According to descriptions of similar items these grass mats were used on the bottom of kayaks as insulation from the cold water, as well as for comfort. I was unable to take exact measurements of the length as the mat was in a somewhat fragile state with frail ends the available surface was not long enough to support the entire mat when unrolled. It is very large.